Notes : Backpacking in the mountains will be crowded around Christmas and especially near spring break. Big Bend National Park has been undergoing changes over the past twenty years or so, but still has many features I find attractive. It's very large (and getting larger--the Rosillos Mountains section was added to the northern portion of the park recently), and has a spectacular range of scenery ranging from juniper covered mountains to volcanic desert badlands to deep, narrow canyons down at the river. Major changes over the last twenty or so years include the collection of an entrance fee (in addition to camping fees for overnight stays), the increase in visitation (although those who have been to Yosemite, Yellowstone, or the Grand Canyon would scoff at this), and the increase in river travel, particularly packaged river expeditions. The Terlingua/Lajitas communities just west of the park have gone through somewhat of a boom, I'm told.The essence of the park remains unchanged, however, unless you happen to show up on one of the busiest days. If you absolutely must have a guaranteed camping site, I'd recommend calling the park headquarters in advance ((915) 477-2251). (You may now, at times, reserve some camping sites on-line through reserve.usa, but sometimes this site doesn't seem functional.) I also strongly suggest you get a map of the park before you go to get an idea of the layout of the park and the general geography. Trails Illustrated puts out an excellent map of the park complete with trails and distances as well as all the primitive campsites, for both backpacking and car camping. Very generally speaking, most of the park is a desert scrub terrain, with assorted buttes, mesas, draws, and a few mountains and towers. Most people enter via Persimmon Gap in the north, then approach the main information center (where you pay your fee) at the center of the park, at the foot of the Chisos Mountains. 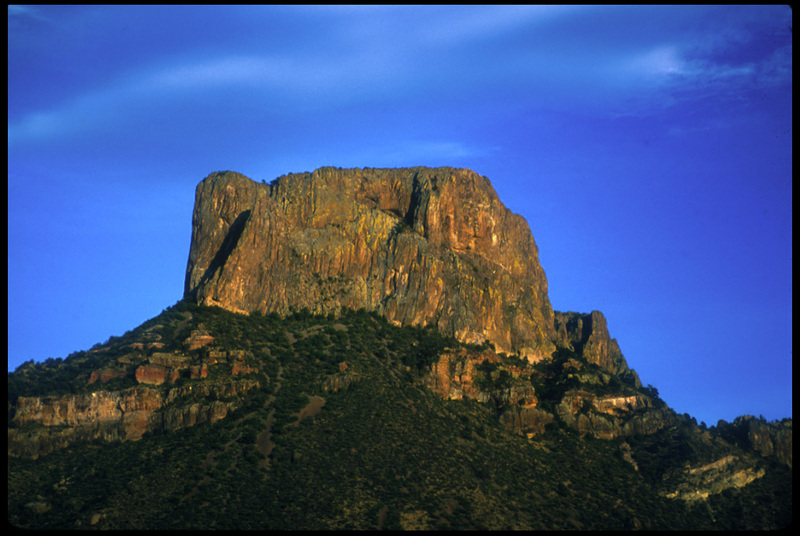 The Chisos reach to 7825' (Emory Peak), and are covered with juniper, oaks, and pinyon pines. The campground in the center of the Chisos (the Basin--look at a topo map and you'll understand why it's called that) is the oldest developed spot in the park, and certainly the most popular destination. It's popularity is well deserved. The Basin has spectacular scenery, even from the campsites, and is the trailhead for the most popular hikes. The temperatures are ten to fifteen degrees (F) cooler here than in the lower elevations of the desert floor. (NOTE: A recent Ranger talk has convinced me that although the temperatures are cooler in the summer and daytime, they're also warmer at night than the surrounding lowlands.) Also in the Basin is a ranger station, a small store, a lodge (sort of like a motel), and a restaurant. Stores and gas stations have come and gone in various places in the thirty years I've been visiting, so who knows what may be there when you visit. Most people want to camp at the Basin, and it's usually the first place to fill up, so their next choice is either Rio Grande Village, to the east, along the Rio Grande, or Cottonwood campsite, to the southwest, also along the Rio Grande. Leaving the Basin and heading toward Rio Grande Village, the elevation decreases (the Basin is at 5400') and the topography becomes fairly flat desert scrub again. Rio Grande Village is not particularly attractive to me, but it does have pay showers (which can often have an hour wait or more), and a decent grocery store. The campground is large and has a lot of the Winnebago type crowd. It seems to be pretty noisy there often, too. Remember, it will be much more humid and hot here than in the Basin. If you head toward Castolon (and Cottonwood) instead, you'll pass through some pretty severe looking badlands, then arrive at the Cottonwood site which is (or was) a much more primitive site. 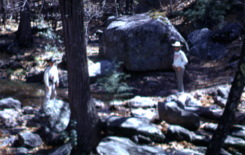 There are several primitive camping sites reachable by car or truck on the improved and unimproved roads in the park. Some of these can be excellent sites for sunrise and sunset photography. This is in no way meant to be a comprehensive list of hiking trails in the park, but just a small sample from my own experience. The definitive Big Bend hike is most likely the South Rim trail (here's the GORP trail description and map, and here's my description of an overnight hike along it). It's strenuous enough that most visitors don't attempt it, but popular enough that you'll almost always meet plenty of people along it. It runs from the trailhead in the Basin to the South Rim of the Chisos, a rather severe bluff with a spectacular overlook. It's about 15 miles round trip, but can vary depending on which variation of the loop you take. There are several designated campsites for overnight camping along the trail, but it can be done in one day. Also along this trail is the cutoff for the Emory Peak summit trail, the highest point in the park. (I've put a map with GPS tracklog and Topo! generated map here. )If you don't feel up to the South Rim, or just want to get warmed up, I'd suggest the Lost Mine trail. It's a modest 2.5 miles to the top, with some elevation gain, and the trailhead is near the entrance to the Basin. I frequently use it as a sort of breaking in hike my first day in the park, and I've had some very good light for photography in the late afternoon from the peak.If you want to experience hiking along the desert floor, try the Chimneys trail. It's a level, straight hike through desert scrub to a landmark of stone outcroppings which look sort of like, well, chimneys. Be prepared in hot weather. A rather remarkable thing has happened over the last decade in Big Bend National Park; the reintroduction of the black bear (Ursus americanus). Except, they weren't reintroduced. Apparently they've just wandered in on their own from Mexico. In the fall of 1999, I verified this myself when I saw a large juvenile or an adult, about 200 lbs., walking down the road just outside the Basin near the Lost Mine Peak trailhead in early evening. Now, one thing the Park Service has done right in Big Bend is to institute a zero tolerance policy on garbage at the first sign of bear. All backcountry campsites in the mountains, and even the Basin campgrounds have bear boxes. So far this has helped keep bear/human contact to a minimum. I've been going to Big Bend for over thirty years. I first recall being there in 1967 (shown here with my brother Victor.) About all I remember of that trip is staying in very flimsy accommodations and doing the South Rim hike. I went to the park several times in the mid-eighties while I was in the oil field. I went out there in 1985 to see and try to photograph Halley's comet. These pictures are from that trip, and are taken from the Lost Mine trail. The air is sometimes spectacularly clear, but these days it is much less likely to be this clear.